This listing from 2005 (!) contains commentary about VTA adjustment using the track Helplessly Hoping from a Hot Stamper pressing of CSN’s So Far. Helplessly Hoping is a wonderful song that has a lot of energy in the midrange and upper midrange which is difficult to get right. Just today (4/25/05) I was playing around with VTA, having recently installed a new Dynavector DV-20x on my playgrading table (a real sweetheart, by the way), and this song showed me EXACTLY how to get the VTA right. Posted in Advice - Playback, Genre - Rock - Hippie Folk Rock, Labels We Love - Atlantic/Atco, Top Artists - Crosby, Still, Nash and (sometimes) Young and tagged audiophile vinyl, Better Records, hot stamper vinyl, Hot Stampers, hot stampers vinyl, tom port on October 20, 2018 by humorem. DEJA VU is an album we admit to being obsessed with — just look at the number of commentaries we’ve written about it. Posted in *Our Record Overview - The Good, A List of Albums We're Obsessed With, A List of Personal Favorites, Labels We Love - Atlantic/Atco, Masterpieces of Rock and Jazz, Top Artists - Crosby, Still, Nash and (sometimes) Young, Top Engineers - Bill Halverson, Top Engineers - Stephen Barncard and tagged audiophile vinyl, Better Records, hot stamper vinyl, Hot Stampers, hot stampers vinyl, tom port on October 10, 2018 by humorem. The only time Crosby, Stills, Nash & Young actually sound like a real rock and roll band is on the track Almost Cut My Hair. According to Stephen Barncard, one of the engineers on Deja Vu, the track was actually recorded live in the studio. Boy, it sure sounds like it. The amount of energy the band generates on this one song exceeds the energy of the entire first album put together. Posted in *Our Record Overview - The Good, A List of Personal Favorites, Advice - Louder Is Better, Demo Discs for Energy, Genre - Rock - Big Production Rock, Genre - Rock - Big Rock Sound, Genre - Rock - Hippie Folk Rock, Top Artists - Crosby, Still, Nash and (sometimes) Young and tagged audiophile vinyl, Better Records, hot stamper vinyl, Hot Stampers, hot stampers vinyl, tom port on October 2, 2018 by humorem. This listing contains commentary about VTA adjustment for 200 gram vinyl, using the CSN track Helplessly Hoping. Helplessly Hoping is a wonderful song with plenty of energy in the midrange and upper midrange area which is difficult to get right. Just today (4/25/05) I was playing around with VTA, having recently installed a new Dynavector DV-20x on my playgrading table (a real sweetheart, by the way), and this song showed me EXACTLY how to get the VTA right. VTA is all about balance. The reason this song is so good for adjusting VTA is that the guitar at the opening is a little smooth and the harmony vocals that come in after the intro can be a little bright. Finding the balance between these two elements is key to getting the VTA adjusted properly. When the arm is too far down in the back, the guitar at the opening will lose its transparency and become dull and thick. Too high in the back and the vocals sound thin and shrill, especially when the boys all really push their harmony. The slightest change in VTA will noticeably affect that balance and allow you to tune it in just right. To be successful, however, there are also other conditions that need to be met. The system has to be sounding right, which in my world means good electricity, so make sure you do this in the evening or on a weekend when the electricity is better. That’s the easy part. The hard part is that you need a good pressing of this song, and those don’t grow on trees. The vast majority of CSN’s first album and the vast majority of So Far’s are junk. Trying to get them to sound right is impossible, because they weren’t mastered right in the first place. But if you’re one of the lucky few who has a good pressing of Helplessly Hoping, try tweaking your VTA adjustment and see if you aren’t able to dial it in even better than before. Since the Classic heavy vinyl version is also excellent, it too can be used to set VTA. But of course you are setting VTA for a thicker record, which means you will need to note where the setting is for thick and thin vinyl respectively and make sure that the VTA is correct for each. As good as the Classic Record is, the guitar at the opening of Helplessly Hoping tells you everything you need to know about what’s missing. The guitar on the Hot Stamper domestic copies has a transparency that cannot be found on Classic’s version. The Classic gets the tonal balance right, but their guitar doesn’t have the subtlety and harmonic resolution of the real thing. But most people will never know what they’re missing on Helplessly Hoping, because they will never have an amazing sounding copy of this song. The hot copies are just too rare. Posted in *Our Record Overview - The Not So Good, Advice - Audiophile Heavy Vinyl, Advice - Playback, Advice - What to Listen For - Transparency, Heavy Vinyl Mediocrities, Labels With Shortcomings - Classic Records - Rock and Pop, Top Artists - Crosby, Still, Nash and (sometimes) Young and tagged audiophile vinyl, Better Records, hot stamper vinyl, Hot Stampers, hot stampers vinyl, tom port on October 2, 2018 by humorem. The next song is To The Last Whale, which starts with Nash and Crosby’s multitracked voices in a big hall. With the correct VTA, their voices should sound silky and sweet. If your arm is too far down in the back, they will get a bit dull. Too high, and they will lose that breathy, “fluffy” quality. And once you get their voices to sound just right, make sure the ending of Shadow Captain is still punchy and dynamic. A crappy remix, with added guitar, ugh. This song sounds WONDERFUL on the better pressings. One of the best reasons to play this album. It’s probably better here than it is on almost any pressing of the album it comes from: CSN. This track tends to be aggressive. This track on the typical pressing of this album will tear your head off. On properly mastered copies, it’s surprisingly smooth and sweet, a quality I never associated with this song before, until I played the Hot Stamper. This song also sounds WONDERFUL on the better pressings. Another one of the best reasons to play this album. Nice but a little spitty as a rule. This track tends to sound dull but sometimes it’s magical. Nothing special, from a nothing special sounding album, Stills’ second outing (which usually sounds like cardboard). This track can sound quite good on the better pressings, better than almost any pressing of the album it comes from: CSN. Nice, and, as with some cuts mentioned above, better than almost any pressing of the album it comes from. Posted in *Our Record Overview - The Not So Good, Labels We Love - Atlantic/Atco, Top Artists - Crosby, Still, Nash and (sometimes) Young, Top Engineers - Bill Halverson and tagged audiophile vinyl, Better Records, hot stamper vinyl, Hot Stampers, hot stampers vinyl, tom port on September 30, 2018 by humorem. 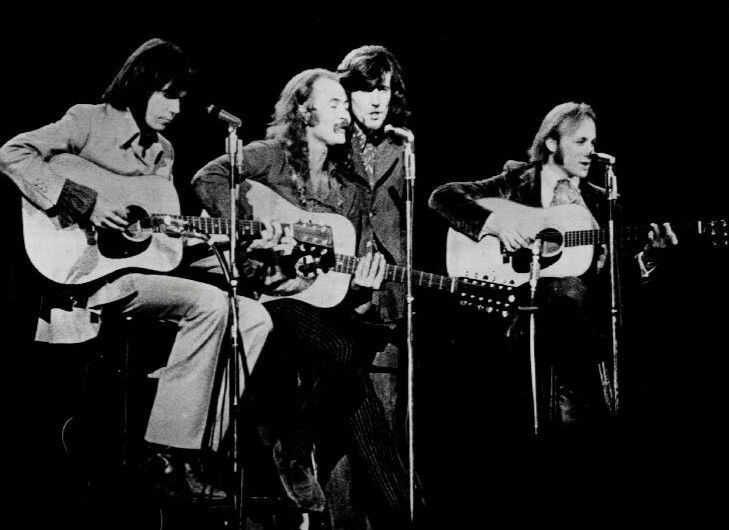 Detail on Crosby Stills and Nash’s First Album – Holy Grail or Audio Trap? Detail may be the Holy Grail to most audiophiles, but detail can be a trap we all too easily fall into if we are not careful. Tonal balance is the key. Without it no judgments about detail have any real value. One example: As good as the Classic Heavy Vinyl pressing is, the guitar at the opening of Helplessly Hoping tells you everything you need to know about what’s missing. The guitar on the Hot Stamper domestic copies has a transparency that cannot be found on Classic’s version. The Classic gets the tonal balance right, but their guitar doesn’t have the subtlety and harmonic resolution of the real thing. The MOFI guys and the CD guys often fall into this trap. Get the sound tonally balanced first, then see how much detail you have left. Detail is not the end-all and be-all of audio. Those who think it is usually have systems that make my head hurt. The most important advice can be found under the heading Hot Stamper Shootouts — The Four Pillars of Success. Here are more entries in our ongoing Shootout Advice series. Posted in Advice - What to Listen For in General, Labels We Love - Atlantic/Atco, Top Artists - Crosby, Still, Nash and (sometimes) Young, Top Engineers - Bill Halverson and tagged audiophile vinyl, Better Records, hot stamper vinyl, Hot Stampers, hot stampers vinyl, tom port on September 25, 2018 by humorem. Now one thing I know about the Nautilus is that although it is wonderfully transparent in the midrange, it may very well take the cake for the most bloated, out of control bass in the history of Half Speed mastering. What song on that album has almost no bass, just lovely voices in the midrange? You guessed it. Helplessly Hoping. The Nautilus got one track right, and ruined the rest. Using that track for comparison will fool you, and when it comes time to play a whole side of the album you will quickly hear what a disaster it is. Posted in *Our Record Overview - The Really Not Good At All, Advice - What to Listen For - Bass and Whomp, Genre - Rock - Hippie Folk Rock, Half-Speed Masters, Heavy Vinyl Disasters, Labels With Shortcomings - Nautilus, Top Artists - Crosby, Still, Nash and (sometimes) Young, Top Engineers - Bill Halverson and tagged audiophile vinyl, Better Records, hot stamper vinyl, Hot Stampers, hot stampers vinyl, tom port on August 30, 2018 by humorem. A Hall of Shame pressing and another Classic Records LP badly mastered for the benefit of credulous audiophiles. If you bought the Classic Record Heavy Vinyl pressing, you should know by now how badly Classic Records ripped you off. Posted in *Our Record Overview - The Really Not Good At All, Advice - Audiophile Heavy Vinyl, Five Star Albums, Heavy Vinyl Disasters, Labels With Shortcomings - Classic Records - Rock and Pop, Top Artists - Crosby, Still, Nash and (sometimes) Young, Top Engineers - Bill Halverson, Top Engineers - Stephen Barncard and tagged audiophile vinyl, Better Records, hot stamper vinyl, Hot Stampers, hot stampers vinyl, tom port on June 24, 2018 by humorem. Of course it’s easy to argue that finding good sound on an album with two or more members of Crosby, Stills, Nash or Young, in any configuration, has never been easy. It’s the rare copy of either of the first two albums that’s even listenable, and the CSN album from 1977 doesn’t sound nearly as good as any of the first three Crosby/Nash albums. Which simply means that the “good” sound of our Hot Stamper copies is far better than what most audiophiles own of any of these guys in combination. Their solo albums are a different story altogether. The first solo albums by David Crosby (1971), Stephen Stills (1970) and Graham Nash (1971) are three of my favorite records of all time; each is a brilliant recording, each contains powerfully compelling music (the Nash album especially). Two made our Top 100. Posted in Advice - Audio Progress, Five Star Albums, Five Star Albums at Better Records, Our Top 100 Rock and Pop List, Top Artists - Crosby, Still, Nash and (sometimes) Young and tagged audiophile vinyl, Better Records, hot stamper vinyl, Hot Stampers, hot stampers vinyl, tom port on June 21, 2018 by humorem.